How to Reach: One can hire a private vehicle or a bus from the Sanguem district in South Goa. It is located on the eastern border of Goa and can be reached from Panaji (53 kilometers) and Margao (54 kilometers). amongst the thick forest cover on the slopes of the Western Ghats. The lush green forest cover is home to a variety of animals and birds. 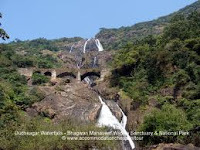 The Bhagwan Mahavir sanctuary also has interesting geographical formations like the Devil's Canyon and the Dudhsagar Waterfalls. The Devil's Canyon also makes an ideal watch tower from where one can view the wildlife here. The core of this wildlife sanctuary consists of the Mollem national park. It is recommended that you stay here for a couple of days to view the wildlife in a sanctuary as big as this one. Accommodation facilities are provided by the Directorate of Tourism. The location of the sanctuary on the slopes of the Western Ghats has enabled a luxuriant growth of vegetation and varied flora over here. The vegetation consists of a mix of tropical evergreen, semi-evergreen and moist deciduous forests. One can find plant species like Lagerstroemia, Xylia and Dalbergia in Bhagwan Mahavir wildlife sanctuary. The thick vegetation forms a canopy over the sanctuary due to which sunlight is hardly able to reach the floor of the forest. Thus, the growth of grass is sparse but one can find bushes and shrubs here. The wildlife in this sanctuary is varied and one can find big, small, herbivores and carnivores co-existing in natural environment. The species of animals here include the Indian Bison known as Gaur, Sambhar Deer, Leopards, Spotted Deer, Slender Toris, Jungle Cats, Malayan Giant Squirrels, Pythons and Cobras. This sanctuary is particularly noted for leopards and its numerous reptile species. One can find many species of poisonous and non-poisonous snakes here. Among the birds one can find species like Black Woodpecker, Malabar Pied Hornbill, Paradise Fly Catcher, Drongo, Wag tails, Barbets, Great Indian Horn Bill, Kingfishers, Shrikes, Emerald Dove, Grey Jungle Fowl, etc.